BAGLIETTO 42 M "BLUE SCORPION"
Last June 31st at the Baglietto shipyard, "Blue Scorpion", a 42-m motor yacht designed by Francesco Paszkowski, was launched. The hull is of steel and the superstructures of aluminium, the bottom is of the displacing type and there are three decks, plus a fly. The fly deck is very spacious, and features all of the accessories necessary to guarantee the owner and guests the maximum in open-air relaxation, including a Jacuzzi hydro-massage tub and roomy sundecks, a bar corner and, of course, the control station. Beneath the fly bridge, we find the large wheelhouse deck, where the master's cabin is located, equipped with a double bed and private bath. Towards the stern, there is an open-air relaxation area protected by the stern extension of the fly. On the main deck, we find a full-sized suite forward, equipped with an office corner and a large bathroom with hydro-massage tub and separate toilette area, astern of which is the galley area, with the mess hall for the crew. The stern area itself is entirely taken up by the spacious saloon. There is a sofa area equipped with numerous accessories for relaxation, and a dining area, with a table that can seat 10 people comfortably. The cockpit, accessed from here, has even more space for relaxation, and is furnished with sofas and coffee tables. The lower deck houses the guest cabins in the central area and service rooms forward, where the crew cabins and the holds are also located. The guests enjoy large double cabins with private bathrooms, as well as two cabins with twin beds, also with private bathrooms. The crew quarters are suitably isolated and independent, so that the owner and guests have all the privacy they need. Aesthetically, the Baglietto 42-m "Blue Scorpion" has a superstructure with sleek, modern lines, designed by Paszkowski with the obvious intention of creating an exclusive yacht. 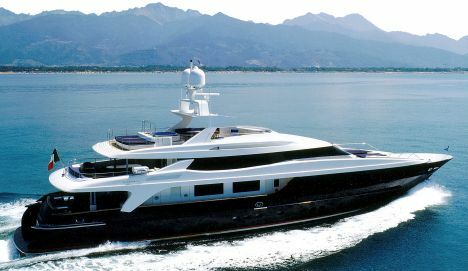 This boat was built in the Baglietto shipyard in La Spezia, the production and maintenance areas of which have been renovated and enlarged. For this reason, on the occasion of the launch of the "Blue Scorpion", the shipyard also inaugurated its new travel lift, which can lift 720,000 kg and will enable Baglietto to carry out refitting and extraordinary maintenance on boats up to 60 meters in length. For further information, please contact: Baglietto; Viale San Bartolomeo 414; 19138 La Spezia; tel. : +39 0187 59831; fax: +39 0187 564765; Web site: www.baglietto.com; e- mail: baglietto@baglietto.com.